I've had my eye on this company and product ever since they launched their Kickstarter campaign in 2016. The SwitchBots shipped a while ago, but I had to wait for the Hub to be available so I could try everything with my Google Home. The result? One of the simplest smart home gadgets I've reviewed to date, but definitely not the prettiest. Easy to install Getting it on a switch or button is a matter of seconds. Adding it to the app took a minute. Adding the hub a couple of minutes. Compatibility The Bots work with a variety of buttons and switches, and can push, pull, push and hold, and pull and hold. Versatility You can use it to automate light switches, coffee machines, appliances, electronics, computers/servers, and more. Battery life It uses a replaceable battery with about 600 days of use. 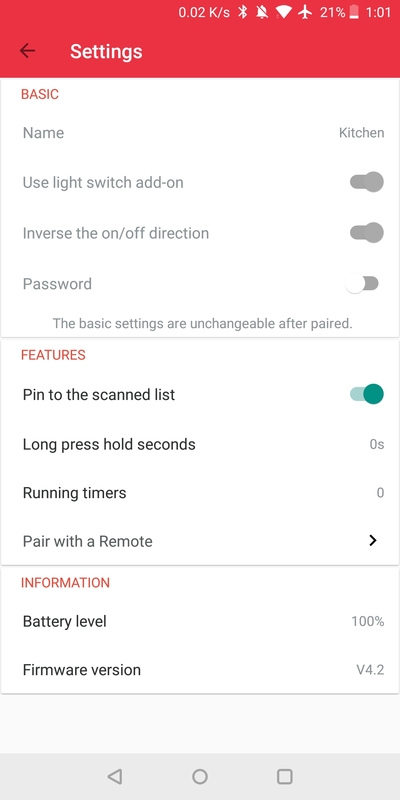 Timer You can set schedules to turn on/off the SwitchBot, and that works even if you're not within Bluetooth range. 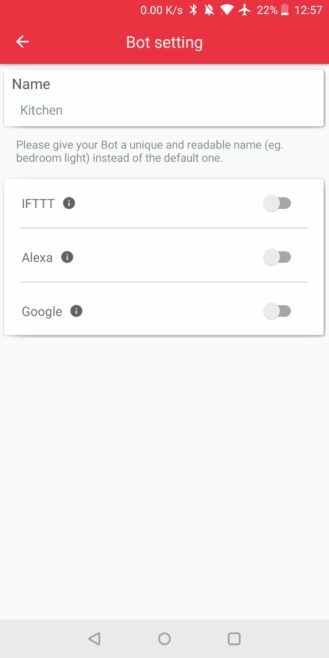 Integrations SwitchBot is already compatible with IFTTT, Google Assistant/Home, and Amazon Alexa. Others are promised. Price At $29, the SwitchBots aren't that expensive compared to the competition. The Hub's price is also acceptable: $49. No toggle or sequence You can't set the Bot to go on then off or program a sequence of presses. Bulky This is not the prettiest or most invisible way to automate anything. You get used to it, though. Limited force I tried installing these on roller shutter wall switches and the 1.0 kgf wasn't enough to push or pull the button. Android app It does the job, but its documentation and design can be improved. It took me half an hour to stumble on how to enable the Google Home integration. The SwitchBots are small and box-shaped, with a plastic build that doesn't feel cheap. It's a simple and utilitarian design with one mechanical arm that swings down and up and idles in the middle. They come in both black and white colors, as seen in the image at the top of the post and the one below. 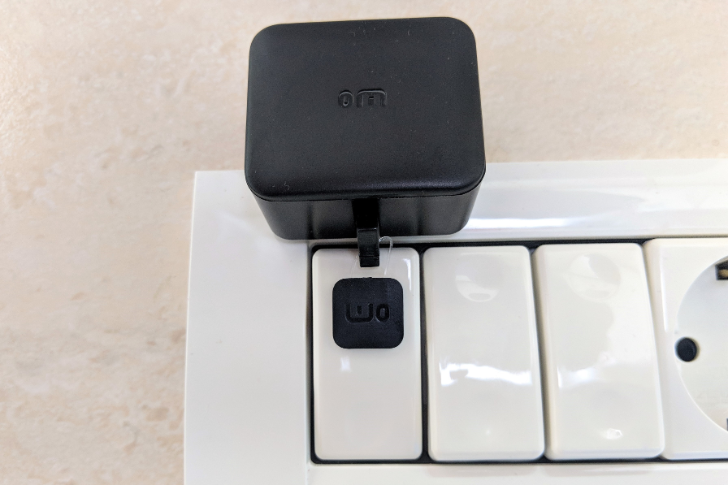 I personally prefer the white one as it blends better with my home setup, but if you're installing one on a coffee machine or electronics, you may want to grab the black one instead. The Bot comes with two 3M stickers so you still have a back-up plan in case you install it somewhere and would rather change that later. It also has a small square sticker add-on with a fishing rod that is essential if you want to pull a switch, not just push it. The solution seems a little inelegant, but it's very efficient and I've had no issues with it at all. The Bot can be installed on any button and most switches. Only the super thin and thick toggle light switch doesn't work with it (it's pictured at the end of the support page here). 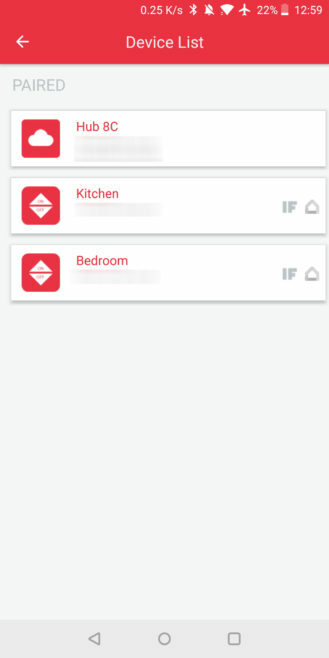 The possibilities are near endless with it: a light switch, an appliance's button, different electronics, a computer or a server, and more. It even occurred to me that I could get one set up on my indoor intercom, so I could buzz myself in even if I forgot the building's gate key. Along with a smart door lock, this has the potential to allow me to walk in and out of my apartment without any keys, and remotely grant entrance to someone I trust. I still haven't tested it in that setting, but I plan on doing so soon. Once it's set up, the SwitchBot remains attached in place. You can still push the button with your finger, so it doesn't block manual control. You connect it over Bluetooth to your phone (we'll get to this part later) and then you can start controlling it from your phone. If you want remote access to it over Wi-Fi, even when you're not home, you can get a SwitchBot Hub. The Bot can accomplish two different actions: push and pull. It can also hold them for a few seconds, so you also have push-and-hold and pull-and-hold. After it's done, it returns to its idling state in the middle, which lets you retain manual control over the button or switch should you need that. Push is easy to accomplish as the arm swings down and hits the button. There's a 1.0 kgf force behind it, which is fine for most switches and buttons. The competing MicroBot Push offers 1.6 kgf, however, so it is a little heavier-duty and may work for stronger switches like the ones of a roller shutter. It's also bulkier, pricier, and more poorly reviewed though, and that's why I still prefer the SwitchBot. Looping .gif of the push function. Light goes from on to off. Pull is a bit more ingenious. 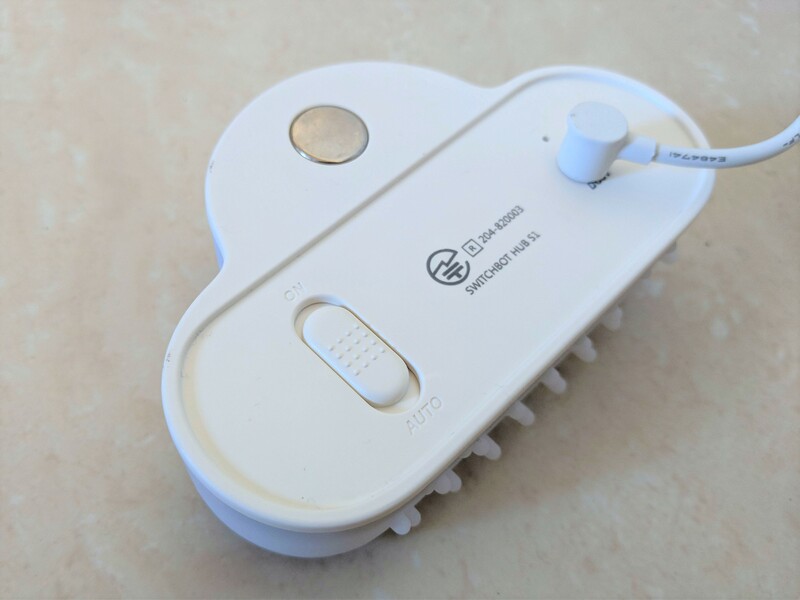 If you need it, you attach a little fishing rod + sticker add-on to the arm and stick it to the button. When the arm swings fully up, it pulls the sticker and thus the button with it. That's a very smart way to allow you to control two functions with the same Bot. Looping .gif of the pull function. Light goes from off to on. 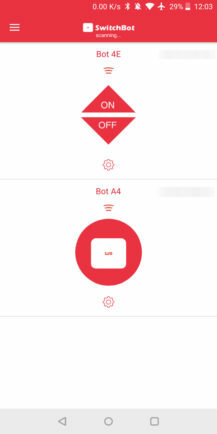 The SwitchBot Hub works as a Bluetooth-to-WiFi bridge for the Bots. 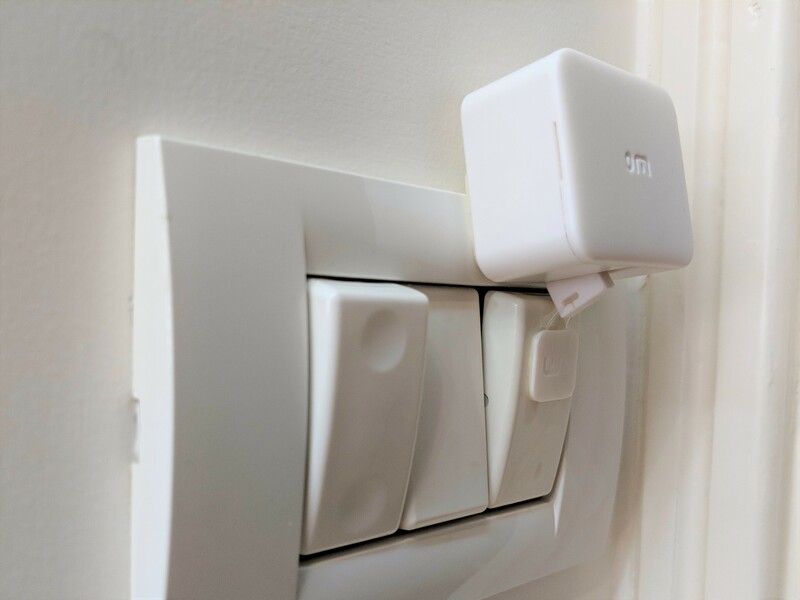 Plugged in, it can receive commands over WiFi and talk to your SwitchBots over Bluetooth. 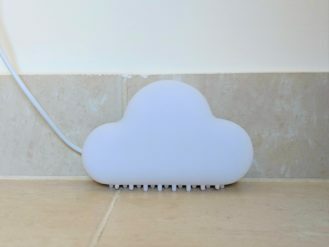 It has a cloud-shaped design, several multicolored LED lights, and a magnet on the back that attaches to a wall mount. It can serve double duty as a night light, though I found it very distracting with the latter. Through a switch on the back, there are three physical states to set the Hub in: On (color breathes continuously), Off (no lights at all), and Auto (only lights up when a command is issued). Here it is when on and set to a single color. And now the rotating rainbow that comes by default. Whoa. And finally, when a command is issued and it's either On or Auto, it lights up in blue and a pink dot moves across the seven LEDs. After admiring all the color combinations, I just turned it off. It was way too visually stimulating in the dark. You can reduce the brightness of the LEDs though, if you want to keep it on. Once installed on a button/switch, the setup process with my phone was super fast. 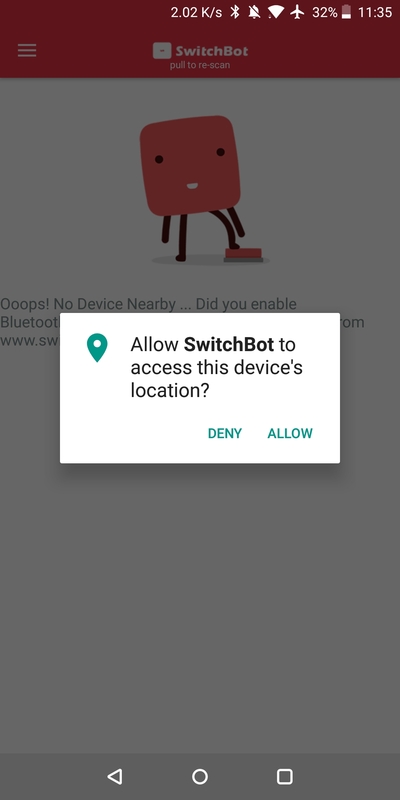 I installed the app, granted it location permission (because Android nowadays puts the Bluetooth permission inside location, so the app has to request it if it's going to connect over Bluetooth), and the bot instantly showed up inside the app. I didn't have to do anything. I set up both Bots and went on to discover what can be done with them. 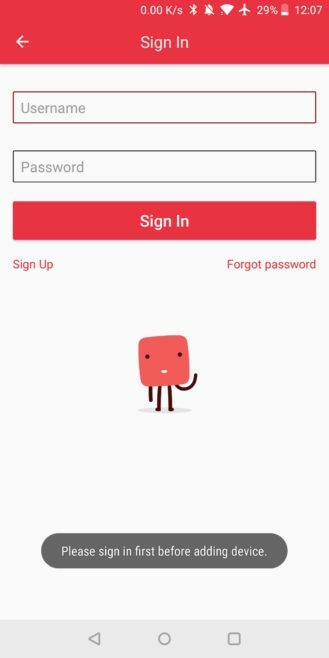 The app isn't super intuitive, but it does the job. 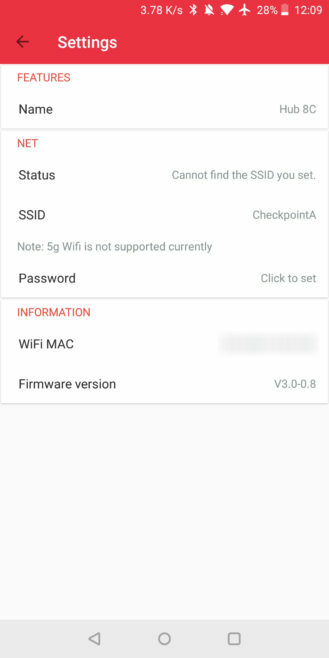 Above every bot, there's a signal indicating whether you're connected over Bluetooth (WiFi-like icon for some reason, as in the middle screenshot below) or through the Hub (cloud-like icon). The Bluetooth icon is disconcerting and I sent feedback to the team reporting it, I was told several things would change in the app soon and this is among them. 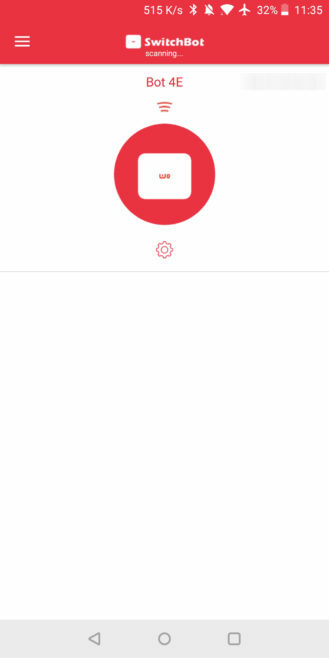 The bot icon changes between a regular circle button if you leave the default setting and two on/off triangles if you enable the light switch add-on mode. In the settings, you can also pick the Bot's name, inverse the on/off direction (which I needed to do for my switches), check its battery level, and change the duration of its push or pull. By default, it just does the action and returns to idle, but you can have it hold for several seconds. 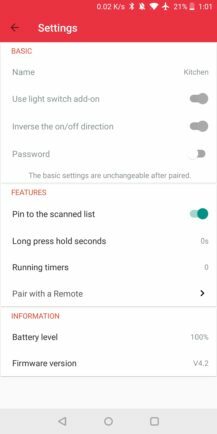 This is also where you can set multiple timers for the Bots, which are transferred and run locally on them, even if your phone is out of Bluetooth range. 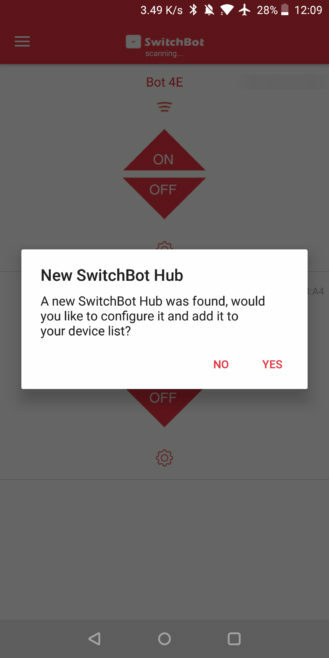 If you want to add a Hub to your Bots, you need to start by creating a SwitchBot account. I did that and noticed one little anomaly: the screen to enter the confirmation code said it sent an email to tom***@g***.com, even though my email address starts with "ma." 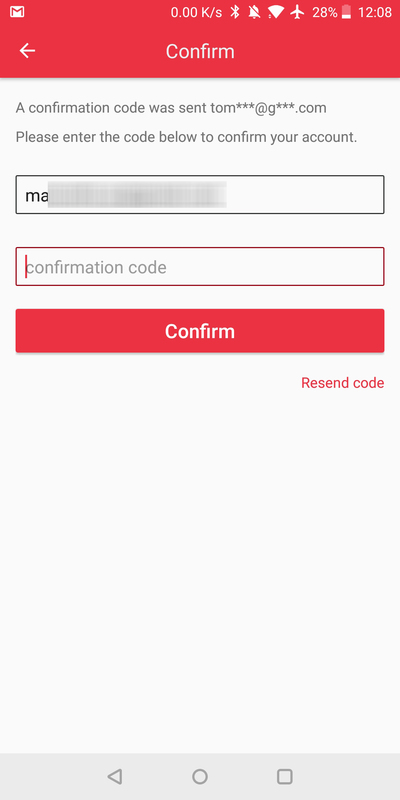 Regardless of the error in displaying that, I received the confirmation code just fine and was able to input it and sign in. The team also told me this bug would be ironed out soon. From the side menu, you can now add a hub, which is just as easy as adding Bots. It's immediately detected by the app and you can teach it your WiFi's SSID and password so it can connect to it. Once the hub is connected to your network, you can control your Bots remotely, whether you're in the vicinity but out of Bluetooth range or somewhere else altogether. 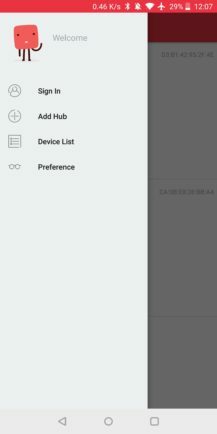 The Hub is also essential for any smart home integration. 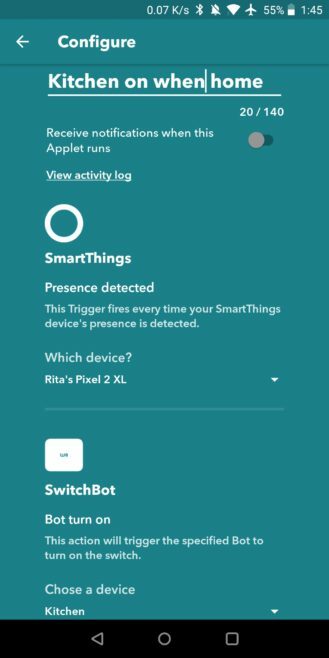 It wasn't immediately obvious to me how to add my Bots to my Google Assistant or IFTTT. I tried repeatedly to add my SwitchBot account there to no avail (the Bots didn't show up), until I stumbled on the Device List option in the app's side menu. 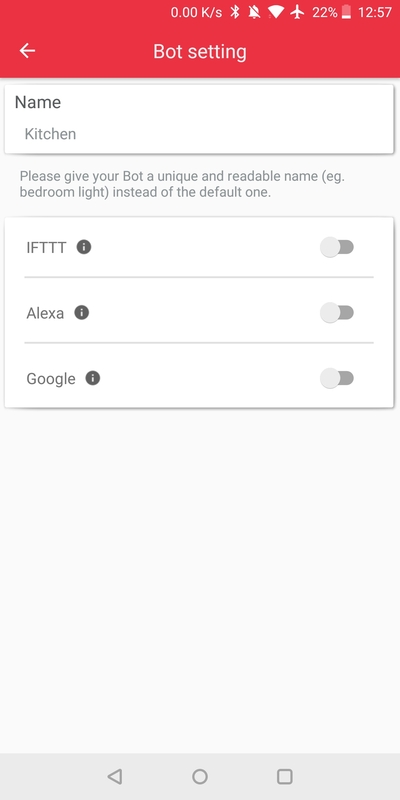 I then discovered that I have to enable every bot separately to show up in IFTTT or Google Home or Alexa. I do applaud the SwitchBot team for that because it still gives you control instead of being an all-or-nothing approach, but discovering the feature isn't easy. Even SwitchBot's documentation and tutorial videos didn't show it - I had to dig for myself to find it. I also sent this feedback to the team and I'm told it'll be improved with the app's redesign. With IFTTT and Google integration enabled for my two Bots, it was then super easy for me to add them to both services. For Google Assistant, you can find SwitchBot among the Home control partners (like Hue and LIFX and Nest) in the Assistant settings or the Google Home app. After linking your account, your approved Bots are imported, and you can assign them to a room or change their nickname. From then on, they're treated like any other smart light. 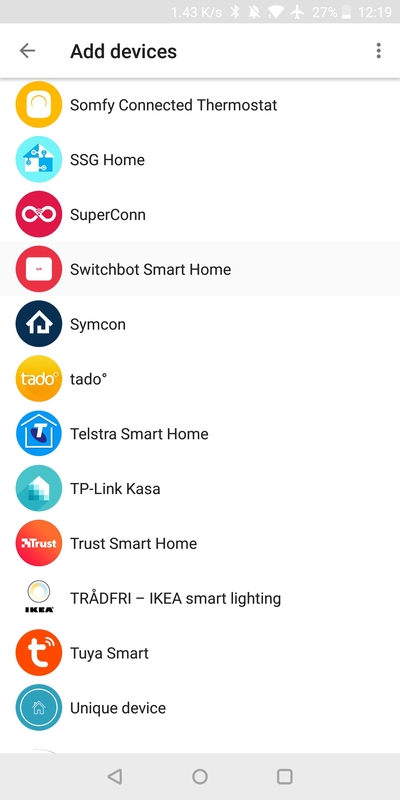 You can turn them on and off individually with voice commands to your Google Home or Assistant devices (speakers, phone, watch, etc). You can use them as part of your Assistant custom routines, and you can control them along with all lights in a certain room group. The IFTTT integration allows you to put the Bots as part of a recipe, as the That (action) part. You can have the lights turn on when you get home, turn off when you leave, and more. I don't have an Echo to test the Alexa integration, but it should work the same as Assistant. SwitchBot also says more partners will be added soon, like Nest, Wink, and SmartThings. 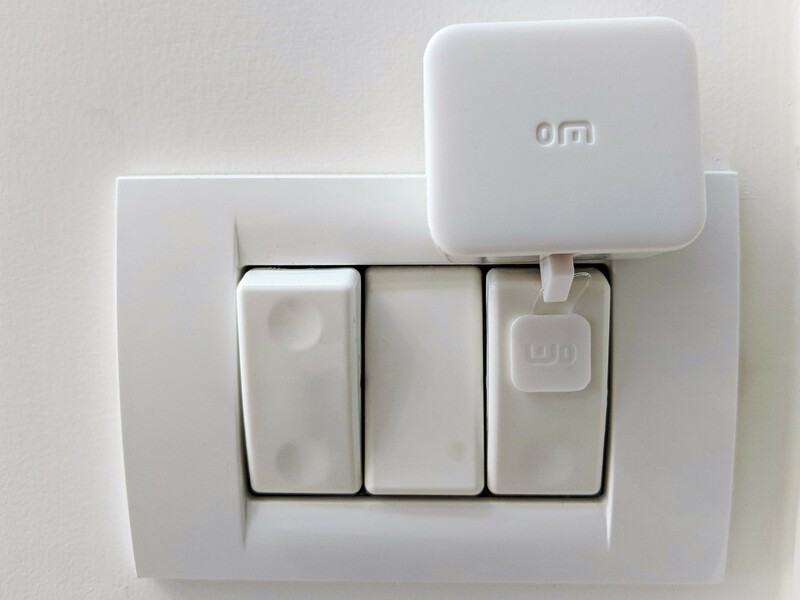 When I first got the SwitchBots, I tried installing them on my roller shutter wall switches. However, the Bots couldn't handle the amount of force required to get the switch pushed or pulled for 20+ seconds to roll the shutter fully up or down. They'd manage to hold for a second or two, then go back to idling. I soon realized that they would need a little more force to be used on those switches. So I tested the Bots on a couple of regular buttons at first, and they worked well there. But then it occurred to me that the two places I'd rather have them are in my kitchen and bedroom to control the lighting. I've had the most trouble trying to automate lights there because they're either LED panels or tubes, so smart bulbs are a no-go. Plus, my SmartThings Hub is also on the US ZWave frequency, but my house uses 220V electricity, so any Z-Wave switch is out of the question because it either won't handle the current or won't connect to my hub. I also can't completely change the entire wall switch panel to a Wi-Fi one because their setups are a little unconventional. 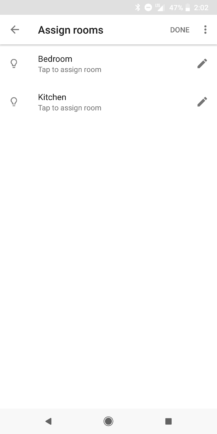 As you can see in the images above, the bedroom (white SwitchBot) has 3 slots with the middle disabled. The right switch controls the main light, the left switch is a three-way to control the bedside lights. The kitchen (black SwitchBot) has 6 slots with 3 switches and 2 different-sized plugs. Finding smart panels for either is impossible. In my current setting, solutions to automate the lighting are very, very few, and none could satisfy the different requirements I had, except the SwitchBot. It doesn't overtake the switch so I can still use it regularly, it's super easy to remove if I ever dislike it, and it works simply and easily. It does look like I hired a small robot arm to push the button for me, though, and I realize that's a little ridiculous. But when I'm carrying groceries, just waking up, cooking in the late afternoon, or getting ready for bed, being able to control my lights with a simple command is a very nice luxury. It's also great for safety when I'm away from home and want to make it look like the house is occupied. 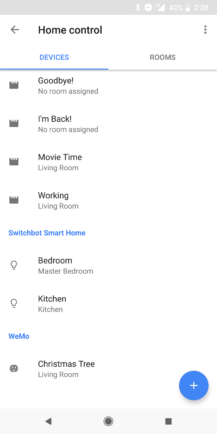 In the month or so that I've been testing the SwitchBots, they have been quite reliable with my Google Home. 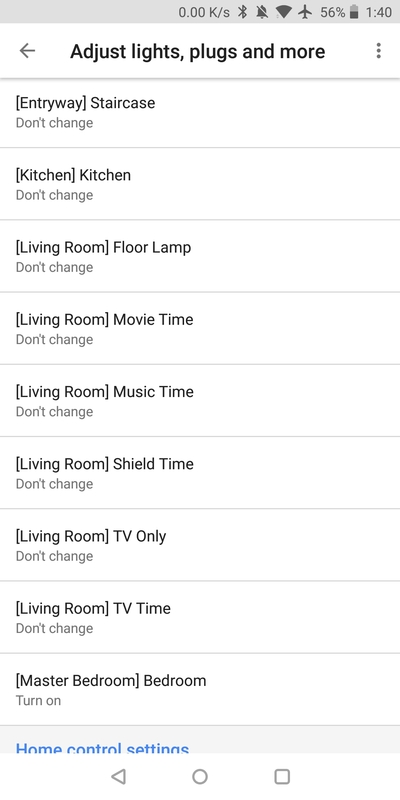 As with all things Assistant, I get the odd "something went wrong, try again in a few minutes," but I've heard it less with SwitchBots than with my LIFX lights, for what it's worth. And I haven't used the SwitchBot Android app ever since. I don't feel the need to. However, if I were using the Bots on something other than a light switch, I would have liked them to have more capabilities. Being able to program a sequence or to toggle on/off in the same command, like competitor MicroBot offers, would be handy for some electronics or appliances, but that's still not a feature of SwitchBot. Maybe that's coming with the app revamp, I'm not sure. Your first reaction when you see the SwitchBot may be to smile and say, "So it's a tiny robot arm that pushes a button?" That's true, but it's also a very versatile robot arm that can do many things on a schedule or remotely, be voice controlled, and help you automate your lights, appliances, and electronics. You could even push the button on your indoor intercom if you already have a smart lock and haven't found any solution to replace the building's keys. The possibilities are many. And yes, there are smart lights, smart switches, smart wall plugs, smart appliances, and plenty of other ways to automate something without sticking a mechanical swinging arm on top of it, but if you are renting and can't make changes or if you already own a product and it's still new and functional, then something like the SwitchBot solves the problem without costing much and while still being easily removable. It's a niche situation, for sure, but the Bots do fill it quite well. The SwitchBot doesn't have a lot of competitors in the market. The only one with a semblance of reliability is MicroBot, but it's quite more expensive and not necessarily better (from my online research - I haven't tried it). As such, the SwitchBot stands alone: functional, affordable, simple to use, and reliable.